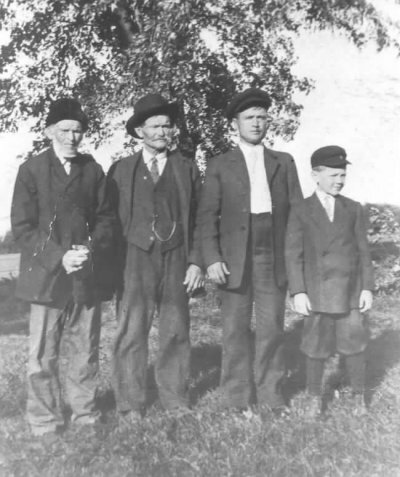 4 Generation - 1914, Strand, Adams Co., Iowa: Gudmund Hendrickson, age 97, b in Norway, his son Henry G. Hendrickson, b in Norway then Goodman H. Hendrickson - son of Henry G. Hendrickson, b at Strand and Marion C. Hendrickson, age 9, the Great Grandson of Gudmund, b at Nodaway. 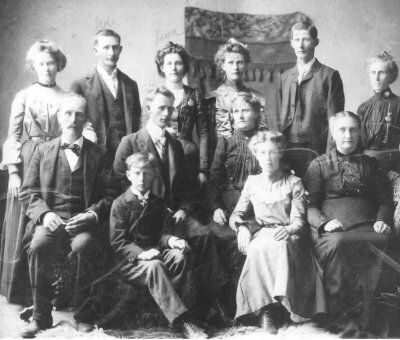 The family of Kleng and Ellen Hendrickson, residing in Strand, Adams Co., Iowa - the eldest son of Gudmund Hendrickson, Kleng and Ellen were both born in Norway. Standing - back row: Clara, Goodman, Lava, Ella, Tom and Molly Front: Kleng (father), Harry (boy in front), Clarence, Bertha, Emily and Ellen (Mother. 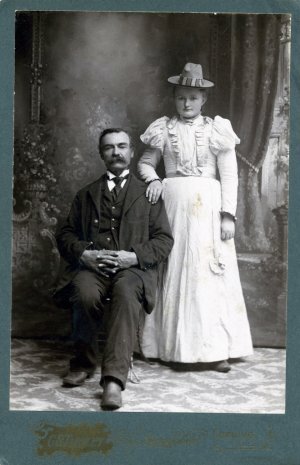 John and Helga/Hulda Larson of Strand, Iowa, John and Hulda were my Great Great Grandparents. Both born in Norway, d Strand, bu in the Larsons Burial Gardens or Rockdale Cemetery as it is known now. 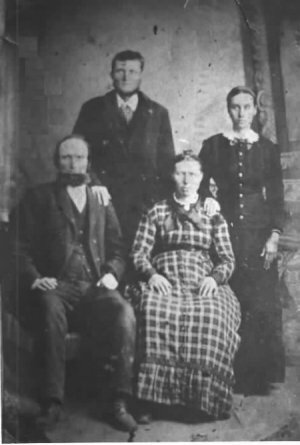 This was taken 15 September 1881 when their son Thomas John Larson, b 25 Sep 1858, LaSalle Co., Illinois married Betsy Serena Thompson, b 17 Apr 1862, LaSalle Co., Illinois, the dau of Thomas A. and Kari Thompson, both b Norway, bu Larsons Burial Garden. 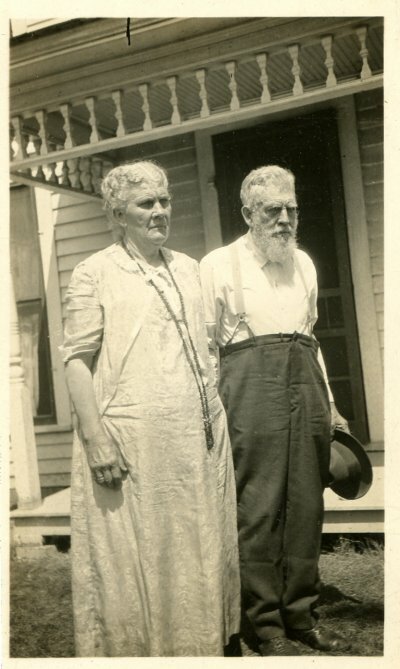 Tom and Betsy were married in Corning, Iowa, both bu Strand Cemetery. Thomas A. Thompson was one of the first Norwegians to come to the USA. Wedding photo of Hulda Knuson, age 15, third child of Helena Larson and Stiner Knutson, granddaughter of John and Hulda Larson, m 25 Feb 1898 at the home of the brides parents, Strand, Adams Co., Iowa to Noah Dujardin, age 50, born in France, son of Flonnion (Joseph) Dujardin and Josephine Rollie. 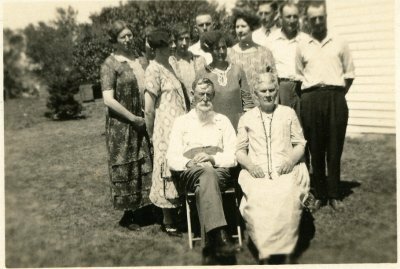 The Joseph Dujardin family was counted in the 1880 Federal Census residing in Milford, Montgomery Co., Iowa.